Motorola Atrix accessories to become the norm? Motorola's CEO has promised to bring the Webtop OS, the internal platform activated when the phone is plugged into a large-screen accessory, will be coming to all top-end devices in its range. 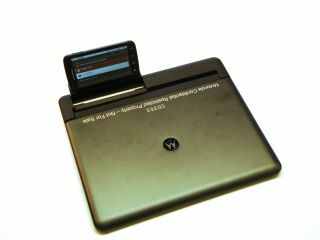 The Motorola Atrix has both the laptop and media dock for connection to HDTVs on offer with the handset, and when connected a new OS (called Webtop) pops up on the screen. This platform offers a desktop-like experience with the phone's home screen in a separate window; essentially, it offers the best of both worlds. And while it's currently only available on the Motorola Atrix, Motorola CEO Sanjay Jha has confirmed that it will be coming to all of Motorola's high-performance phones in the second half of 2011, according to Engadget. This means Motorola will have a tidy line in accessories if each one is proprietary to the device - but we think it's more likely a laptop dock will be offered with an interchangeable dock for each new phone. What's more interesting is Motorola believing that this extra level of functionality - made possible by dual core power - is something the average consumer will come to expect, so let's hope it's a gamble that pays off and brings even more tech toys to our favourite smartphones.